Two decades ago, the original Duke was nothing short of revolutionary. 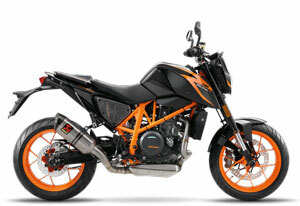 KTM?s first single-cylinder street bike grew into a cult classic, adding extreme fun to a raw and radical concept. Today?s 690 DUKE stays faithful to its ancestor?s ways, but adds future-proof refinements: impressive smoothness, sophisticated electronics, improved ergonomics and tons of grunt. This firmly cements the world?s strongest single-cylinder production motorcycle at the cutting edge of engineering. Long live the Duke!^^Offer ends 30/04/19^^*Ride away price includes all offers, cashback, rebates and discounts.^^Please note this price is for Queensland only. Please contact your local KTM dealer for location specific pricing.